Being a full-time blogger, I have always experimented with content and advertising. I have tried several kinds of ads programs to learn how it works and what can be used to improve my earnings. In past, I also tested several in-text advertising programs. Most of these Ad Networks are compatible with Google Adsense and doesn’t violate Adsense policies. If you do not have Adsense you can use these popular Adsense alternate advertising networks. Before writing about popular in-text advertising networks, I want to say that these ads may irritate sometimes. If you are running a niche blog for affiliate marketing, it can reduce the clicks on affiliate links within a blog post. So, avoid it if you see less CTR in affiliate links or increase in bounce rate. Before using any advertising network, you should also have enough traffic. If you do not have traffic, you cannot earn money by any monetization method. Read few tips to boost traffic of your blog. See best 7 In-Text advertising programs and start earning money with your blog. Viglink is the one I am actively using to monetize my blog. The primary reason is that it does not affect the user experience but help you in improving your earning. Viglink converts your outbound links to affiliate links. If there are no outbound links to stores, it converts few words to affiliate links. If any of your readers click on the link and makes a purchase, you will earn a commission. UseThisTip uses VigLink and I am happy to see the good conversion. It has automatically boosted my earning with any extra efforts. Infolinks is the most popular in-Text advertising network. It pays per click basis. More click you receive, more revenue you will earn. In past, I used this ad network for a long time but stopped using it because of user experience issue even if earning was really impressive. Hovering links shows pop-up ads and users should click to convert. Minimum payout of Infolinks is $50 which is easy to reach if you have good traffic on your blog. It pays via Paypal and bank wire transfer. 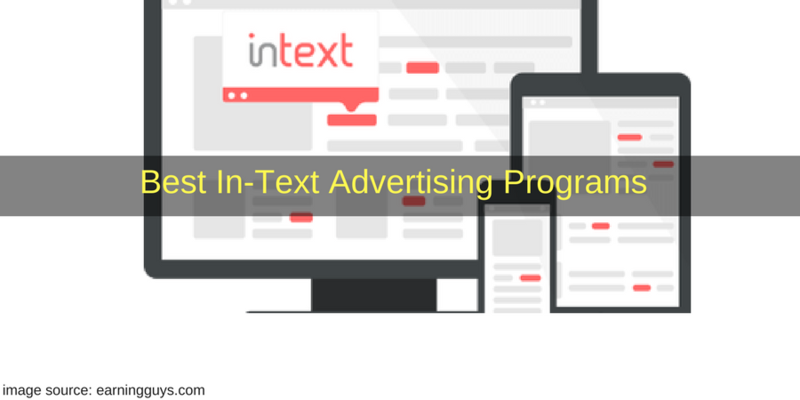 Kontera is another leading in-text advertising network. It is easy to setup for any kind of blogs. It has plugins to use on WordPress, Blogger, Joomla and Drupal websites. It also works similar to Infolinks and ads work almost same. Like Infolinks, it also has a minimum payout of $50. It pays via PayPal. Clicksor is also a popular ad network that offers In-text advertising along with its banner advertising. It also has a referral program that may earn you 10% of what ever your referral publisher earns. for up to 1 year. It also has $50 minimum payout and pays via PayPal, check and account credit. Vibrant Media comes with 100% user-controlled In-Text advertising. It allows users to view advertising only when hovering the word of interest. It claims to have more than 6000 partners to bring best ads for you. I also tested this once. Ads are easy to blend with your blog to improve the clicks. It has $50 minimum payout. Be Context is also a nice in Text ads network. The work is similar. It ads JS links on your page. You can easily identify those ads because of the double underline. Hovering opens ads and clicking earns you. It also has banner ads and text ads option to increase ads revenue. It gives good browsing experience. It also has $50 minimum payout and pays via Paypal, Bank wire transfer or ACH. Affinity Ads is a popular ad network which also offers in-text advertising. It claims to give up to 95% revenue share to its publishers. It has Smart commercial keyword highlighting technology to give you better earning. Most of the in-text ad networks work in the same way and show hover kind of ads. I only use Viglink because it just adds affiliate links and click on those links is natural. So, it affects user experience in no way and offers a better chance of conversion. Let us know which in-text advertising network your are using. Share your views and experience about in-text advertising with us via comments.